Words of the week is a semi-weekly posting of words I discover via my literary rambles (you can read more about how I capture these and why I started this series here). divagation: a message that departs from the main subject | 'She had a curious trick of pursing her lips reflectively before she spoke; she liked to take her time, and came to the point after interminable divagations down all the lane-ends of memory and overtone, feasting upon the golden pageant of all she had ever said, done, felt, thought, seen, or replied, with egocentric delight.' - Ibid. Words of the Week: Avoirdupois or Desideratum? It's 1am and I'm reading, chuckling along with William Zinsser (The Writer who Stayed) when the word peristaltic halts my progression. 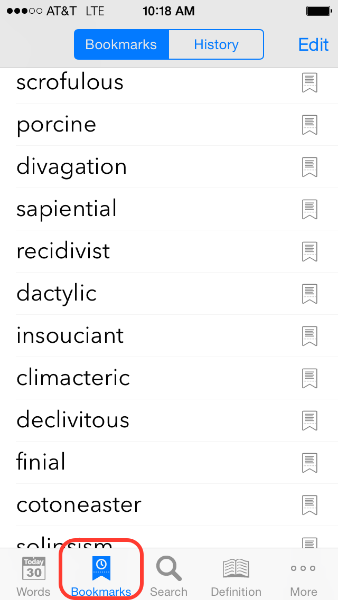 I circle it (as is my custom), reach for my phone, and open the WordBook dictionary app only to discover that there is no peristaltic in WordBook. I google it and find peristalsis. I glance back at the WordBook screen and spy, scrolling across the top of the app, suggested words of which peristalsis is one: 'the process of wavelike muscle contractions of the alimentary tract that moves food along'. For years, I've entertained unexpected visitors. When a word appears unannounced I circle and (most times, immediately) research it. It's more neurosis than habit. I must know. It's also almost entirely superfluous. I rarely remember the definition. But, used enough (or, read enough) one might stick. I generally have to thrust one awkwardly into a conversation before I begin to really know its meaning and, when I do shove it toward my listener, it's usually perceived as wooden as it sounds. But the doing is the remembering part. Which is why I started a small series on this blog of words that I read each week that I don't know. I've collected them for a long time, going back (in the WordBook App) for a few years (thankfully, my WordApp bookmark database has survived many upgrades). WordBook not only tracks your history of researched words but also allows you to bookmark specific words. The bookmark feature also allows you to write notes within each defined word. In my notes, I add the title of the book (or the article) where I read the word so that I can go back and read it again in context. Sometimes, a word will have more than one resource which means I've stumbled across the word twice (or more) without truly comprehending its meaning. For example, this past week I read the word capacious in the novel Look Homeward, Angel and forgot that I had read this before in The Solace of Open Spaces. As I investigate and then comment on a word, I abbreviate the book's title to maintain my flow of reading and keep moving, a peristaltic process. (It's embarrassing how many times I discover the same 'new word'). I've thought about posting this type of series here on my blog for some time. I've avoided it because this practice may come across (to some people) as pretentious. This perception, at first, paralyzed me, until finally, (frustrated by wilting under the opinion of others -an all too common occurrence-), the thought settled into insouciance. It is with such blithe unconcern that I begin this series of new-to-me words that I discover each week. The words will always derive from my current reading and never contrived for appearances sake. The exercise (no doubt) will be appreciated, and read, by none but me, but perhaps merely posting them here will simply become a reliable mnemonic device to aid and abet my feeble memory. You can read my first words posted in this series here. For more on why you should enlarge your vocabulary, consider Beyond Elitism, Better Than Therapy. In the morning: After reading the On Being interview with Mary Oliver, I returned to Mary's poetry and prose. In the interview, she cites Lucretius and Rumi (whom I love), her esteem of them both and her insightfulness into the art of living made me hungry for more of Oliver's works; currently reading: 'New and Selected Poems'. In my bag: I carry a book in my bag even though an entire library exists on my phone. (I don't want to ever be caught without something to read). Currently toting: Travels by Paul Bowles. In the car: Look Homeward Angel by Thomas Wolfe (with a beautiful narration by Scott Sowers) via Audible. On my mobile: Selected Stories by Robert Walser (via Kindle) and Stoner by John Williams (via Oyster). By the bedside: Seven Storey Mountain by Thomas Merton and Long Life by Mary Oliver. The world is: fun, and familiar, and healthful, and unbelievably refreshing, and lovely. And it is the theater of the spiritual; it is the multiform utterly obedient to a mystery.